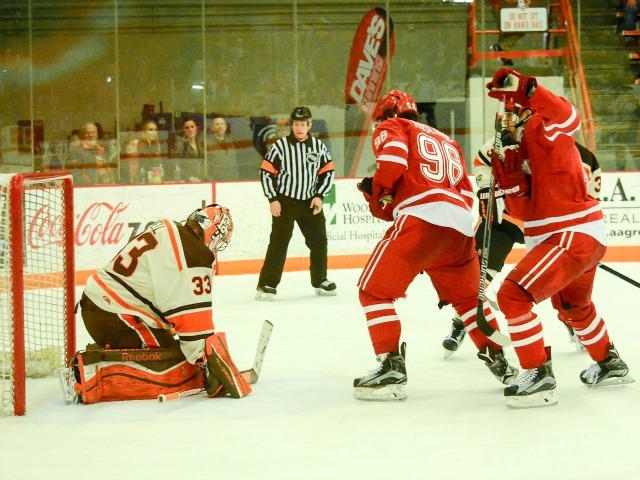 BOWLING GREEN, Ohio – Miami came within 37.8 seconds of its first road series sweep in nearly two years. 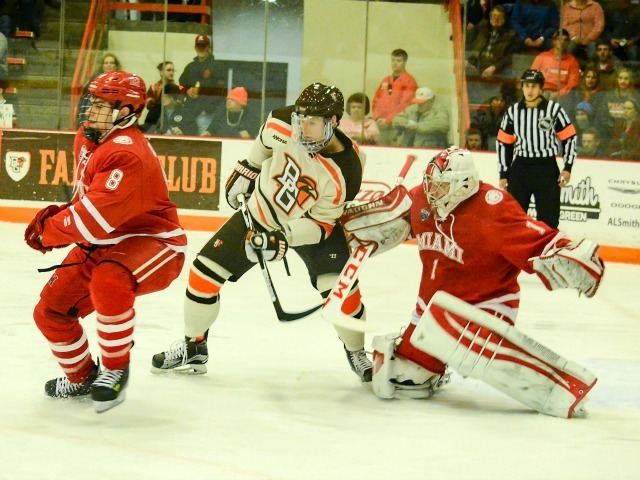 But a final-minute wrister from the high slot by Bowling Green’s Alec Rauhauser beat RedHawks goalie Ryan Larkin on the glove side as BGSU salvaged a 2-2 tie at the Slater Family Ice Arena on Saturday. The RedHawks won the series opener, 6-3 on Friday. It was all Falcons in the first period, as they outshot MU, 10-4 and took the early lead. Bowling Green (6-5-4) was awarded a penalty shot as Brandon Kruse was taken down by Kiefer Sherwood while streaking toward the net unabated with 34 seconds left in the first period, and he converted to make it 1-0. Miami (6-6-2) tied it with 13:28 left in the second period when a blue line rip by Belpedio was partially deflected by Josh Melnick and into the corner of the net. The penalty box door was open much of the first two periods, as the teams combined for 40 minutes, including four roughing penalties, two slashings and a 10-minute misconduct on the RedHawks’ Carson Meyer. Belpedio skated across the blue line uncontested and blasted one by Bowling Green goalie Ryan Bednard with 6:51 left in regulation. Following Belpedio’s goal, Miami had to kill a cross-checking penalty and nearly survived two more minutes of 6-on-5 hockey in an attempt to preserve the win. Belpedio had two more point-blank chances in the final minute of overtime, but Bednard denied both. With his goal and assist, Belpedio has five points in five contests. Melnick has scored in three straight games and has five points in his last five games, and it was the second career helper for Russell. 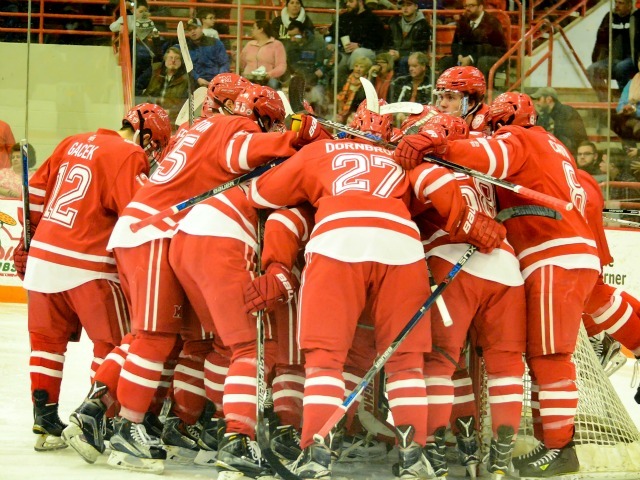 Miami returns home for its final two non-conference games of the season, as the RedHawks host Cornell. Game times are 7:35 p.m. and 7:05 p.m. for Friday and Saturday, respectively. First period—1. BGSU, Kruse 3, pen. shot, 19:26. Second period–2. Miami U., Melnick 6 (Belpedio, Russell) 6:32. Third period–3. Miami U., Belpedio 5 (Green, Hutton) 13:09; 4. BGSU, Rauhauser 4 (D’Andrea, Baylis) 19:22. 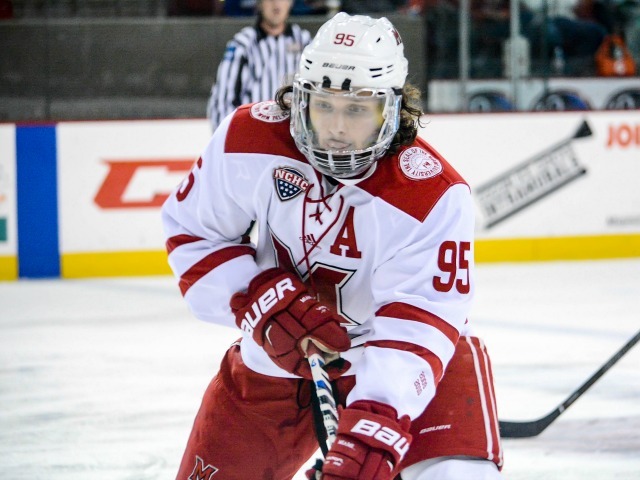 Shots on goal–Miami U. 4-13-4-4–25. BGSU 10-8-7-1–26. 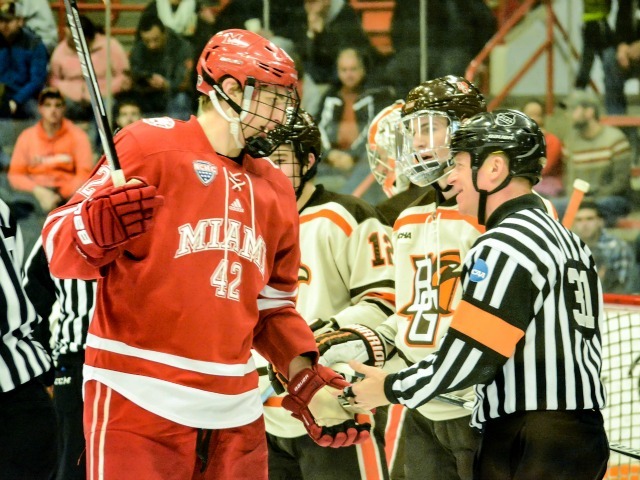 Power plays–Miami U., 1-for-4; BGSU, 0-for-4. Goalies–Miami U., Larkin (24 of 26 shots saved); BGSU, Bednard (23-25).Officials–Referees: Tony Czech, Dan Kovarik; Linesmen: Frank Hempel, T.J. Likens. 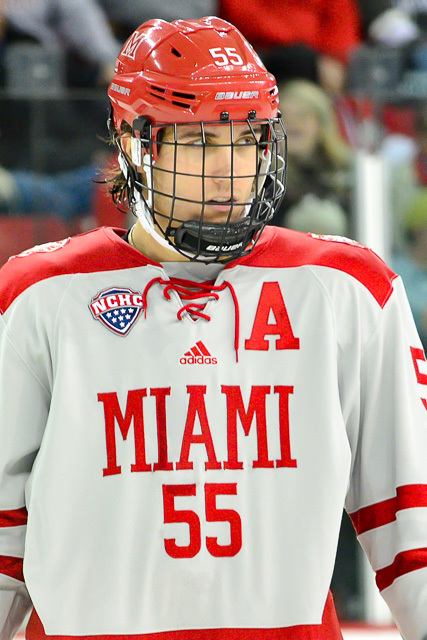 BOWLING GREEN, Ohio – Grant Hutton had scored five times in Miami’s first four games, including a pair of multi-goal contests. 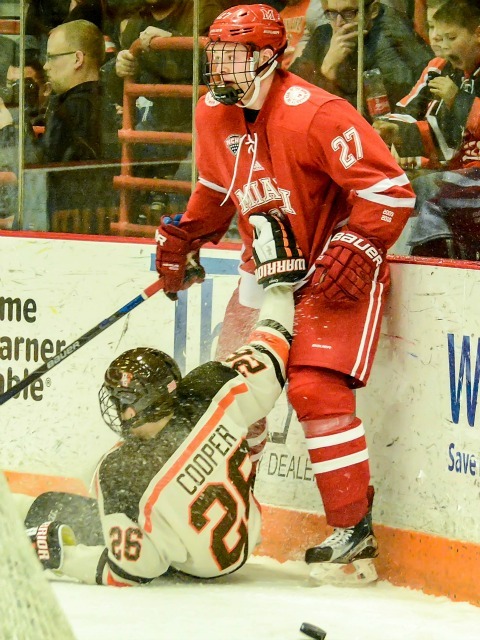 Still sitting on five markers eight games later, the junior defenseman hit the net twice in 38 seconds, breaking a tie at the end of a crazy second period as the RedHawks beat Bowling Green, 6-3 at the Slater Family Ice Arena on Friday. Hutton’s surge capped off a middle stanza that saw MU extend its lead to two only to see that evaporate in a span of 3:45. Miami (6-6-1) opened the scoring 6:15 into the game. The RedHawks held the puck in the offensive zone for more than a minute after the end of their first power play, and during a pileup at the top of the crease, Carter Johnson backhanded one that was stopped by goalie Eric Dop, but Ben Lown fired it in from the side of the cage for his first career goal. Bowling Green (6-5-3) answered by scoring at the end of a long shift as well. Miami goalie Ryan Larkin shut down a point-blank shot, but about 30 seconds later, Connor McDonald whipped a firm wrister into the corner of the net to tie it at the 13:50 mark. The RedHawks regained the lead 2:01 later on a wrist shot by Kiefer Sherwood from the point that seemed to fool Dop. It was initially waved off for goaltender interference, but it was ruled a goal after a fairly brief review. The Falcons trimmed the deficit to one, 3-2 with 9:26 left in the middle stanza when Brett D’Andrea slammed home a one-timer in front of the net off a feed by Cameron Wright. They tied it when Tyler Spezia skated through the Miami defense, went in for a breakaway and backhanded one into the back of the net with 5:41 remaining in that frame. Hutton penetrated on the power play, whipped off a defenseman, corralled his own rebound and buried it with 1:35 left before intermission. Thirty-eight seconds later, he rifled one from just inside the blue line for his third point of the period to make it 5-3. Carson Meyer slammed home an empty netter with 17.3 seconds remaining to cap the scoring, recording a marker for the third straight game. Hutton’s 2-1-3 line tied a career high in points set earlier this season at Maine. Kiefer Sherwood also recorded three points, going 1-2-3. Lown not only scored his first collegiate goal, he earned his first multi-point game as a RedHawks, picking up a helper. Belpedio, fellow blueliner Grant Frederic and forward Conor Lemirande all finished with a pair of assists. These teams wrap up their weekend series at 7:07 p.m. on Saturday. First period—1. Miami U., Lown 1 (Johnson, Frederic) 6:15; 2. BGSU, McDonald 1 (Kruse, Rauhauser) 13:50; 3. Miami U., Sherwood 3 (Belpedio, Lemirande) 15:51. Second period–4. Miami U., Melnick 5 (Lown, Hutton) 2:59; 5. BGSU, D’Andrea (Wright, S. Craggs) 10:34; 6. BGSU, Spezia 1, 14:19; 7. Miami U., Hutton 6 (Belpedio, Sherwood), ppg, 18:25; 8. Miami U., Hutton 7 (Frederic, Knies) 19:02. Third period–9. 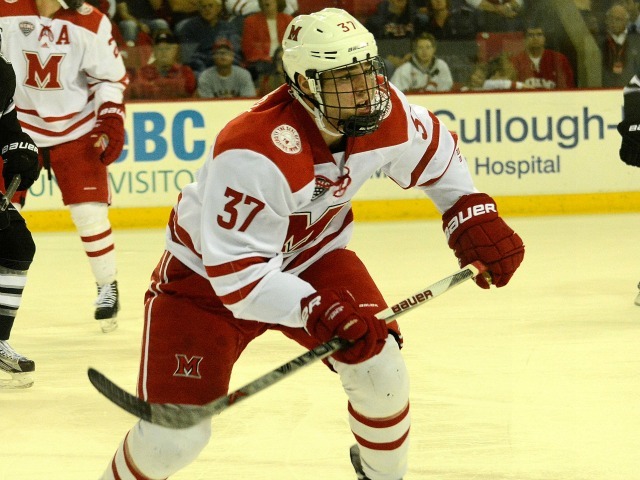 Miami U., Meyer 4 (Lemirande, Sherwood), ppg, eng, 19:43. 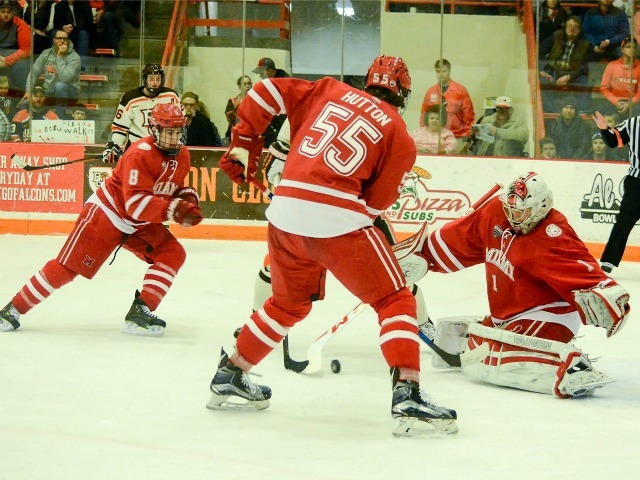 Shots on goal–Miami U. 8-9-10-27. BGSU 4-5-5–14. 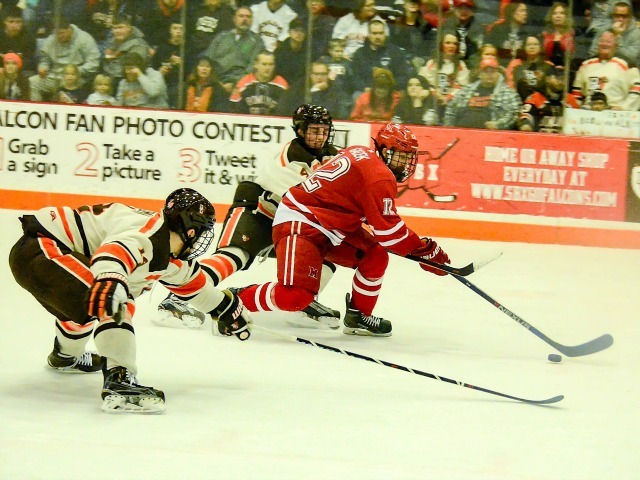 Power plays–Miami U., 2-for-4; BGSU, 0-for-3. Goalies–Miami U., Larkin (6 of 9 shots saved); BGSU, Dop (12-17), Bednard (9-9).Officials–Referees: Tony Czech, Dan Kovarik; Linesmen: Frank Hempel, T.J. Likens. Attendance: 2,157.
WHO: Miami RedHawks (5-6-1) at Bowling Green Falcons (6-4-3). WHEN: Friday, 7:37 p.m.; Saturday–7:07 p.m.
WHERE: Slater Family Ice Arena, Bowling Green, Ohio. 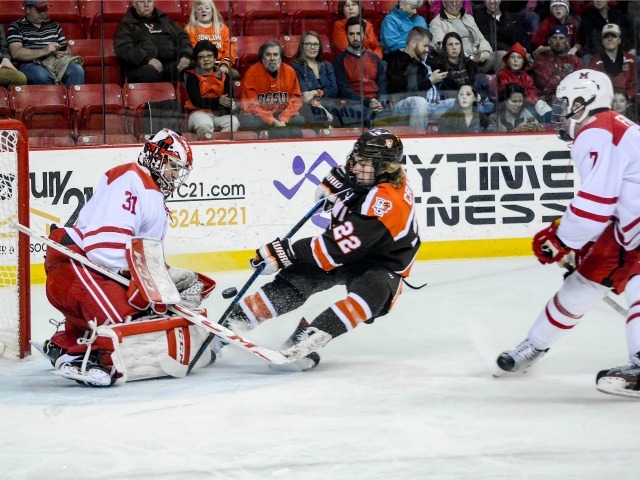 NOTES: Bowling Green dropped a 6-1 decision at Minnesota State last Friday but followed that up with a 4-1 win, as that is the Falcons’ lone loss in their last nine. 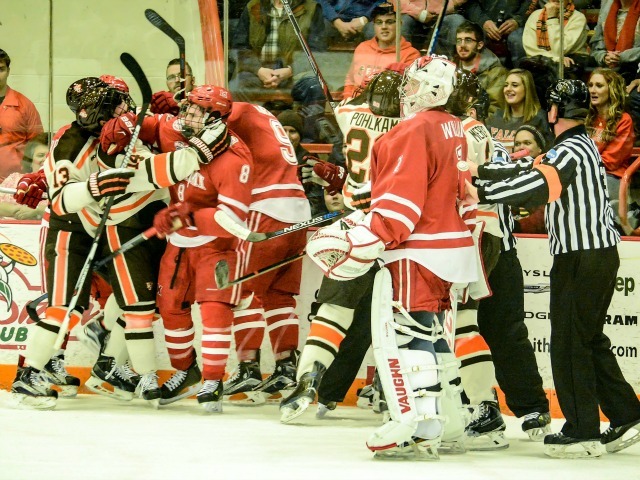 BGSU has dropped just one decision at home this season, going 4-1-2 at the recently-renamed SFIC. The Falcons visited Cady Arena in 2016-17, and the teams split the series. Overall Bowling Green holds a 62-48-8 record vs. Miami, but the RedHawks have won the overwhelming majority of games the past decade. In 13 games, four Falcons have already recorded double-digit point totals. Cameron Wright leads the team in assists (9) and points (14), having scored five times. Bowling Green coach Chris Bergeron (BoB file photo). Stephen Baylis and Max Johnson have 11 points each, and Alec Rauhauser – the team’s defenseman points leader – has 10. The Falcons have three juniors, three defensemen and two freshmen blueliners on their roster, but despite the relative youth, they are 10th in the NCAA in goals allowed per game (2.31). A big reason for that is the play of sophomore G Ryan Bednard, who has a 2.01 goals-against average and .928 save percentage. He was rotating with Eric Dop, but Dop was pulled from his start last Friday and does not have nearly as good of numbers. So Bednard may be in net both nights. Bowling Green still has a Miami feel on its coaching staff, as the head coach is former RedHawks assistant Chris Bergeron, and assistant Barry Schutte also played and coached at MU. OXFORD, Ohio – Fans had to realize this season would come with growing pains. 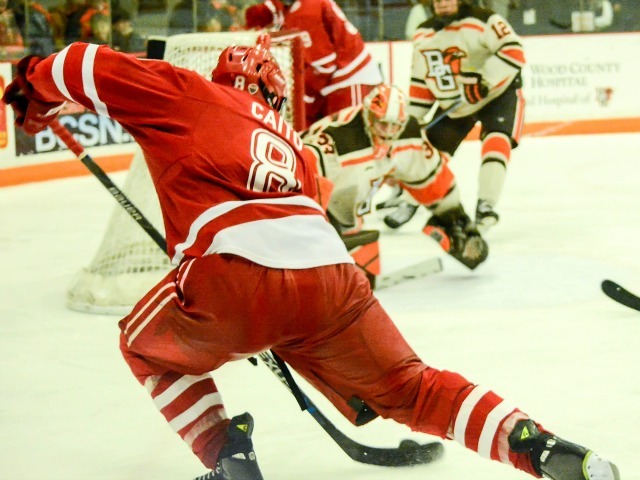 They can chalk Saturday up to that, as Bowling Green fell behind early but scored the final four goals in a 4-1 win over Miami at Cady Arena as the Falcons salvaged a series split. 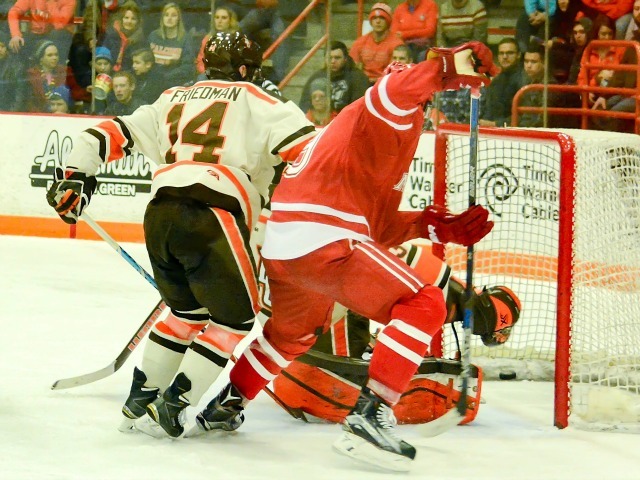 BGSU beat the RedHawks for the second time in 21 games. And the Falcons were 0-6-1 entering Saturday. Ouch. Two things though: Bowling Green is better than its 1-6-1 record, and on Saturday, the RedHawks were worse than their 3-1-2 mark. 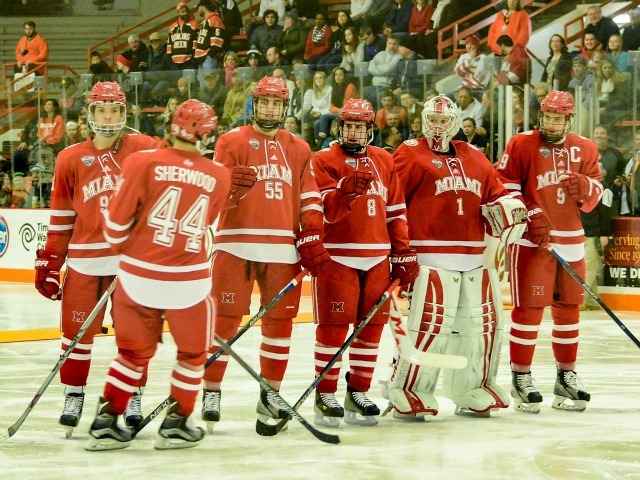 It’s a disappointing finish to an otherwise inspiring non-conference slate, although Miami does head to Ohio State on New Year’s Eve to officially conclude its out-of-NCHC schedule. 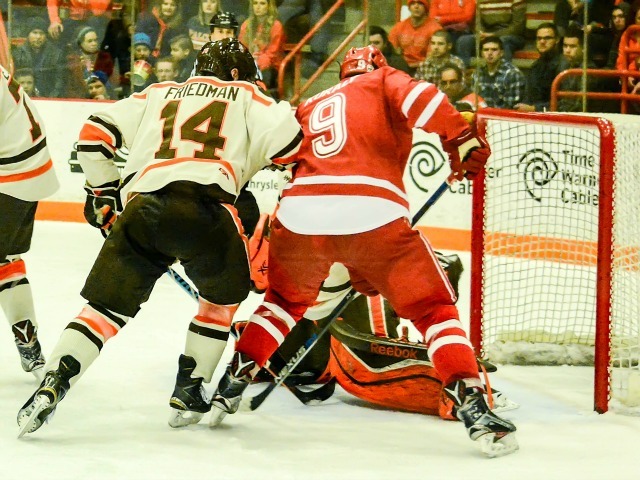 Bowling Green, with former RedHawks assistant Chris Bergeron at the helm, found a way to bottle up Miami’s fast, skilled forwards all weekend, and things will only get tougher for MU from an opponents standpoint, as the RedHawks play 24 of their last 25 regular season games against physical NCHC foes. Much of what fans have seen the first month of the season has been encouraging, but that will need to translate to the ultra-difficult conference schedule Miami faces the next four months. The RedHawks’ first test comes next weekend at Western Michigan. FORWARDS: D-. Not really inspiring to watch from a fan’s perspective after the Louis goal. It seemed like that motivated Bowling Green, which dominated the remainder of this game. Bachman had the bad turnover that resulted in the Falcons’ second goal, although he was trying to do the right thing by clearing the puck to the boards. This corps finished with 15 shots. DEFENSEMEN: D+. It seemed like a slower, less skilled BG team skated around this corps far too often for quality chances. Grant Hutton took three penalties and now has seven in seven games after taking three minors all of 2015-16. Obviously the fault doesn’t lie entirely with this group for the shot differential, but holy smokes, 41-18? GOALTENDING: D+. Larkin has been a stud in net for the most part during the first leg of this season, partly because he has been stellar at controlling his rebounds. He gave up a huge on on the first goal, and on BGSU’s third goal, he failed to control a puck along the side of the boards, and a player poked it in off him from behind the net. He still stopped some great chances. Miami forward Josh Melnick (photo by Cathy Lachmann). LINEUP CHANGES: As feared, Josh Melnick was out of the lineup on Saturday. He was in the concourse and walked with a noticeable limp. He is day-to-day with a lower body injury, and the hope is that he will be ready for this weekend. Willie Knierim dressed in his place. Carter Johnson centered the first line – he was on the fourth line previously! – and did a quality job, but Melnick is an exceptional player that is impossible to replace at this level. On defense, Chaz Switzer and Colin Sullivan were back in and Grant Frederic and Bryce Hatten were scratched. The three freshmen have all been OK but Sullivan has outplayed them all to this point. Sullivan, a former Montreal Canadiens draftee, should not be sitting. OXFORD, Ohio – Miami scored first on Saturday, but that would be the RedHawks’ lone highlight. 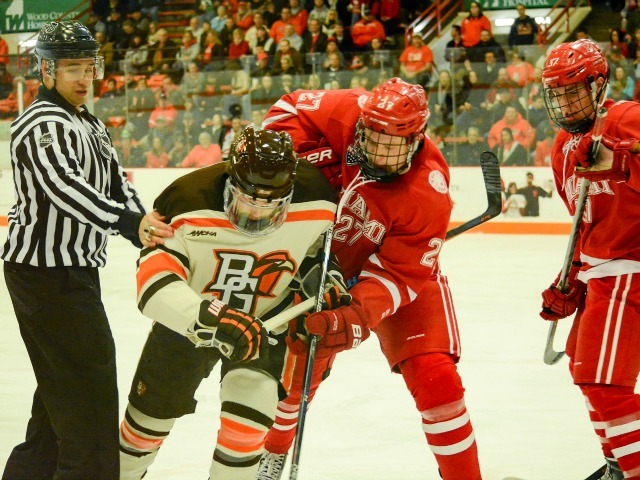 Bowling Green netted the next four goals and dominated on the shot counter, 41-18 in a 4-1 win at Cady Arena. That gave the Falcons their first win of the season and snapped a five-game unbeaten streak for Miami. It was also the RedHawks’ first home loss of 2016-17. MU was 19-1-1 vs. BGSU in the teams’ last 21 meetings. Miami’s Anthony Louis (photo by Cathy Lachmann/BoB). Seven minutes into the game, Carson Meyer skated in and drew multiple defenders to him before sliding a pass across the slot to Anthony Louis, who knocked home his five goal of the season. But with 4:45 left in the opening period, Chris Pohlkamp threw a wrister on net, and Pierre-Luc Mercier threw in a long rebound allowed by MU goalie Ryan Larkin to tie it. Just 45 seconds later, Miami’s Karch Bachman turned the puck over in the slot, and on a resulting 2-on-0, Mitch McLain fed Matt Pohlkamp for a slam-dunk goal to make it 2-1. Bowling Green (1-6-1) extended its lead with 5:43 left in the middle frame as Tyler Spezia drove from the left wing, put the puck on the side of the net, and John Schilling punched it from the back of the cage off the back of Larkin and in. Mark Friedman banged home a loose puck from the top of the crease to cap off the scoring with 10:23 left in regulation. 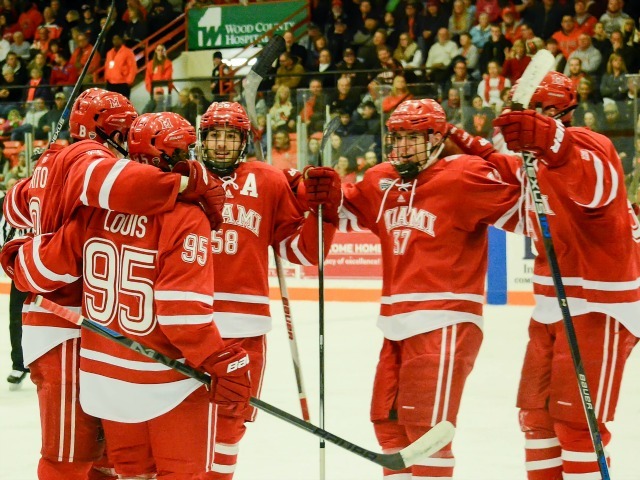 Louis has scored all five of his goals in the RedHawks’ last four games. Meyer extended his points streak to four games, notching seven in that span. Defenseman Jared Brandt also assisted on that goal, picking up his first collegiate point. Miami (3-2-1) managed exactly six shots in each period. The last time the RedHawks were outshot by a 2-to-1 margin at home was Jan. 17, 2014 vs. Nebraska-Omaha. MU will head to Western Michigan next weekend for its first conference games of the season. Both games will start at 7:05 p.m.
OXFORD, Ohio – It’s a pretty safe bet that none of the footage from the first two periods of Friday’s game will make any highlight reels. 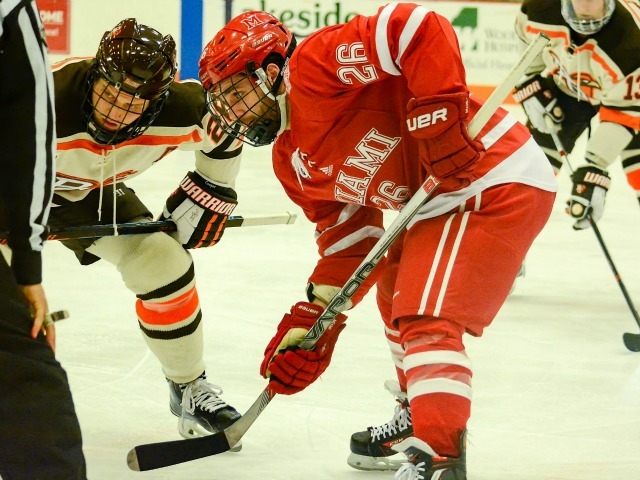 But the third period and overtime made up for the relatively action-free first 40 minutes of hockey, culminating in an OT winner by Anthony Louis as Miami edged Bowling Green, 2-1 at Cady Arena. The Falcons recorded 14 shots on goal through the first two yawn-inducing periods. The RedHawks fared even worse, generating just 10. And most of those 24 were low-percentage chances, easily swallowed up by goaltending equipment. To BGSU’s credit, that was probably the game plan. The Falcons (0-6-1) had allowed 29 goals in six games and did not have the speed or skill to match Miami’s top two lines. So they played tight D. And very well. Miami (3-1-2) struggled to create any kind of transition and seemed to have no room to complete passes anywhere on the ice. But while the RedHawks’ offense was non-existent most of the night, they still found a way to win. And they found a way to win after squandering a one-goal lead late. 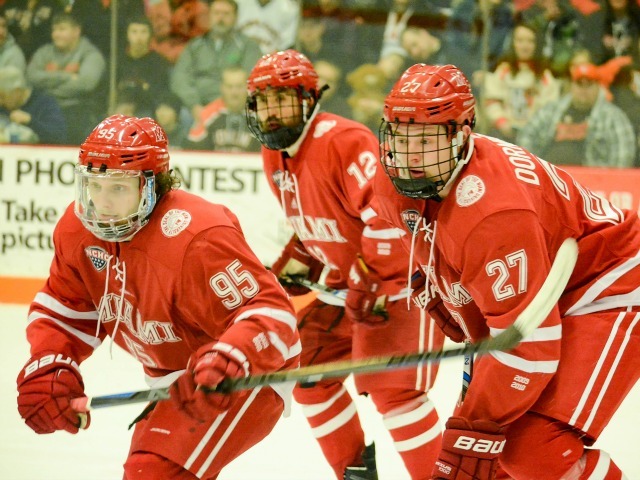 This won’t be the only time this season Miami has to play a team that suffocates its forwards, and the RedHawks will still need to find a way to earn victories like they did on Friday. – First, Josh Melnick coming off late in the third period is a major concern. He took a shift with two minutes left in regulation, did not appear to get hit or fall awkwardly and left the ice showing no ill effects, yet he was not on the bench for overtime. In the Captain Obvious statement of the day, Miami cannot to be without Melnick for any length of time, even if that length is a few shifts. – Miami also had to play with five defensemen for the majority of the second period, as Jared Brandt left after suffering what appeared to be a high hit along the boards. Brandt has been one of the team’s top shutdown defensemen early this season. He returned and appeared 100 percent for the balance of the game. 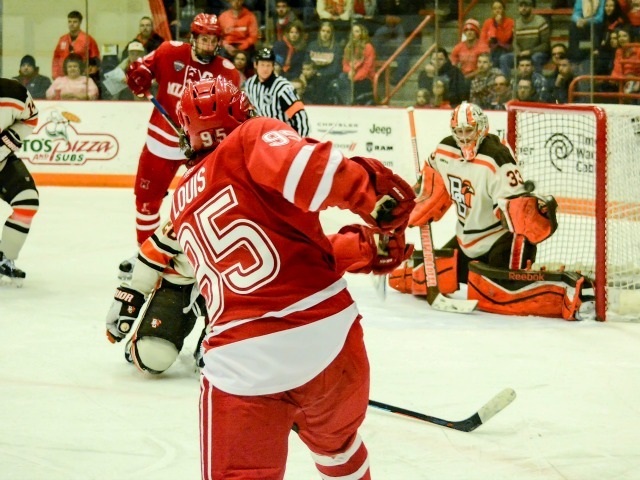 – Not a fan of criticizing officiating, which was pretty solid most of the game, but it’s baffling that Carter Johnson was assessed a major for interference in the third period but Bowling Green was handed a minor for a boarding penalty during which Louie Belpedio was slammed from behind after being lined up for a couple of seconds. Across the board, hockey has been rightly cracking down on those types of hits, and Belpedio’s numbers were clearly visible the entire time he was along the boards. The reasoning is most likely because the Falcons player remained down for some time while Belpedio bounced right back up, which should not be the way penalties should be decided, if for no other reason because it encourages embellishment. 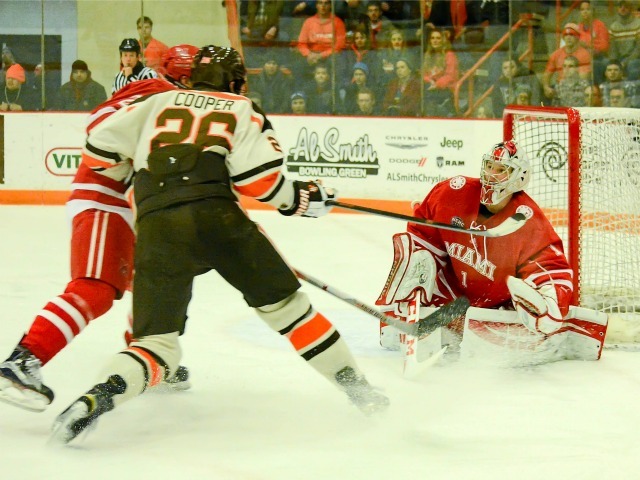 But BGSU did not score on its five-minute power play and Miami netted the game winner after the boarding call, so all was ultimately good for the RedHawks. – Yes, Carson Meyer scored the goal and picked up an assist on the other, so it’s easy to point to him as a hero in this game. But from the first game of this homestand to this one, he has gotten significantly better in every facet, which is partly why he is in position to pick up points. – Louis is up to 94 career points, pulling to within six of the elusive 100-point club. Fifty Miami players have reached that mark. It’s amazing how much Louis’ all-around game has improved from junior year to this one. And oh yeah, he forced a turnover at center ice, which was picked by Melnick, leading to the first goal. FORWARDS: C-. It was trending toward ‘F’ land after two periods, but obviously two goals bolsters their collective grade. Lines 2-4 were nearly non-existent all night, which Bowling Green’s defense deserves much credit for. As much credit as Louis deserves, he didn’t pick up Mark Friedman when he scored from point-blank range to tie it. Ryan Larkin makes one of his 20 saves on Friday (photo by Cathy Lachmann/BoB). DEFENSEMEN: B+. During this homestand, this corps hasn’t done too much to get noticed, and that’s meant as a compliment. They came up big during the major PK, especially Scott Dornbrock, who stepped up his play in the third period for the second straight game. GOALTENDING: A-. It looked like Ryan Larkin got a piece of the tying goal, but it still slipped over his blocker. It’s probably one that he should’ve had, but it was still a great shot from in close. He stopped 20 of 21 shots and has allowed just one goal in two games and six in his last five. He gives Miami a chance to win every night and is spoiling fans. LINEUP CHANGES: Coach Enrico Blasi did not change any of the forwards from last Saturday, playing Alex Alger over Willie Knierim for the second straight game. Alger had an assist on Saturday and was absolutely robbed by Chris Nell on a would-be goal in the first period of this game. Blasi continues to get all eight of his defensemen playing time, as Colin Sullivan sat in favor of Bryce Hatten. Larkin has still logged every minute in net – 370-plus at present – and Andrew Masters again served as the backup. OXFORD, Ohio – For Miami, the third overtime was a charm. 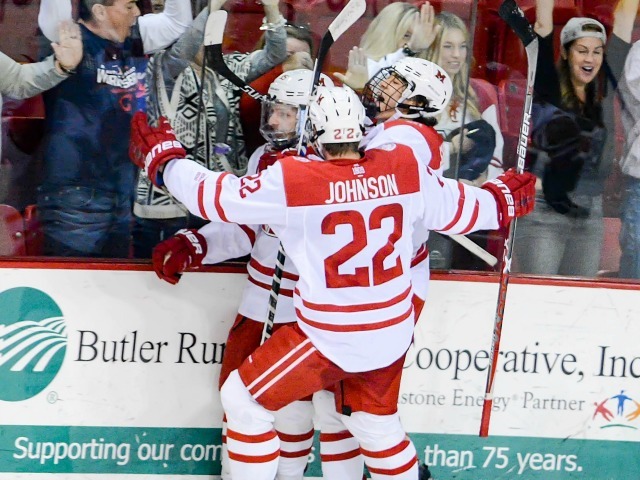 After battling to a pair of ties early this season, RedHawks senior Anthony Louis scored in the extra session to lift Miami to a 2-1 win over Bowling Green at Cady Arena on Friday. The RedHawks extended their unbeaten streak to five games (3-0-2) and remained undefeated in Oxford this season (2-0-2). The teams combined for just 24 shots in the first two periods, with the Falcons leading, 14-10. But 10 seconds into the third period, Louis slid a pass to a streaking Carson Meyer at the side of the net, and he roofed it to five Miami the lead. Miami (3-1-2) was able to kill a major penalty assessed to Carter Johnson for interference, but the Falcons generated the equalizer on a 6-on-5 with 1:06 left in regulation. That’s when Mark Friedman wired a shot just inside the far post from the faceoff circle, sending the game to overtime. Bowling Green (0-6-1) was assessed a boarding penalty a minute into the fourth stanza, and Louis made the Falcons pay. He was left alone to penetrate from the side of the net, and he fired one between the legs of goalie Chris Nell to win it with 2:55 left in the frame. Meyer and Louis both finished with a goal and an assist. Meyer has five points in his last two games, and Louis has recorded points in four straight contests and goals in his last three. They are tied for second on the team with seven points apiece. Louis leads MU with four goals. Goalie Ryan Larkin stopped 20 shots in the win, but he saw his scoreless streak end at 124:57. Josh Melnick ended a short shift with two minutes remaining in regulation and did not return, and the reason is unclear. He did not appear to be in discomfort when he left the ice. The series finale is at 7:05 p.m. on Saturday. 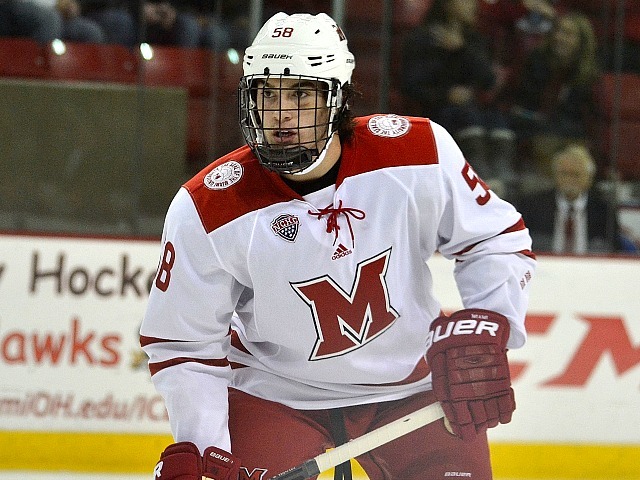 WHO: Bowling Green Falcons (0-5-1) at Miami RedHawks (2-1-2). WHEN: Friday–7:35 p.m. Saturday–7:05 p.m. BOWLING GREEN RADIO: WBGU-FM (88.1), Bowling Green, Ohio. TV: Friday–Fox College Sports alternate (DirecTV Ch. 608). NOTES: What in the world is happening at Bowling Green? 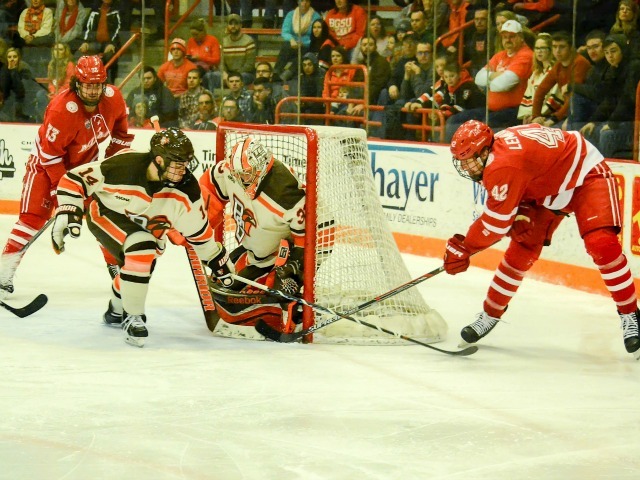 The Falcons were ranked in the top 15 in USCHO’s preseason poll, and they were picked to win the WCHA, yet BGSU has yet to win a game and dropped its first two conference contests. BoB has talked extensively about Miami’s ability to reload in net, a credit to the entire coaching staff’s ability to recruit at that position. 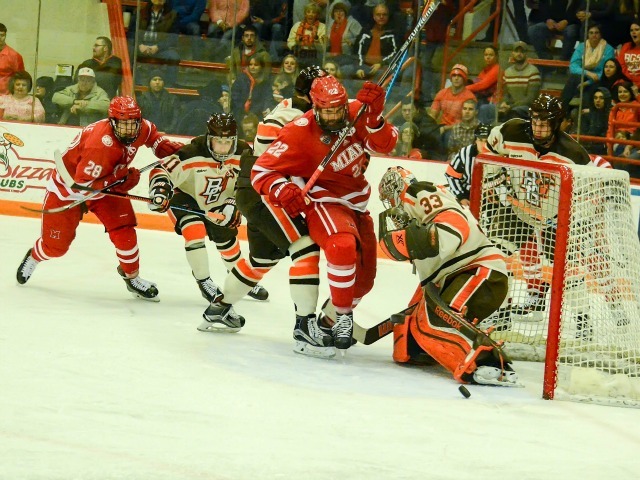 Bowling Green has gotten miserable goaltending, as the Falcons have allowed 29 goals in six games – the second-worst average in the NCAA – for a unbelievably poor team save percentage of .806. 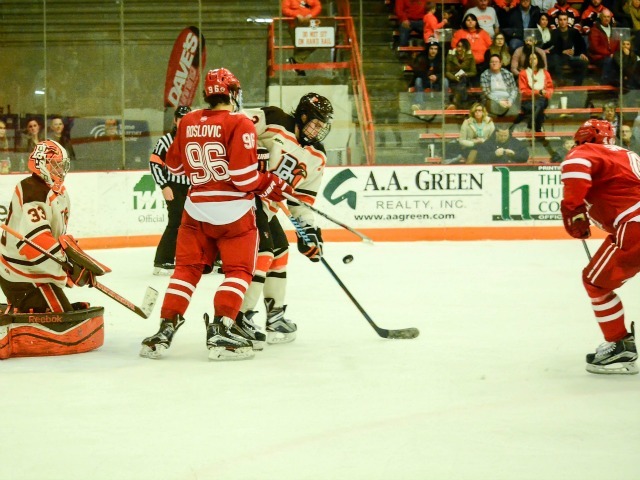 BGSU is only allowing 25.2 shots per game, so it’s hard to pin those numbers on the blueline (actually the Falcons have outshot their opponents thus far). Chris Nell gave up eight goals in less than four periods vs. Ohio State last weekend, but he still has the best numbers on the team with a 3.79 goals-against average and .841 save percentage. Freshman Ryan Bednard is a Florida draftee, but in his first outing, he surrendered four goals on nine shots in just over a period. Defenseman Sean Walker leads the team in goals (3) and points (5), and forwards Matt Pohlkamp and Kevin Dufour have four points each. All three are seniors. Mitchell McLain, Brett d’Andrea and Stephen Baylis have added three points each from the forward corps, and Pierre-Luc Mercier has 58 career points in 123 games. 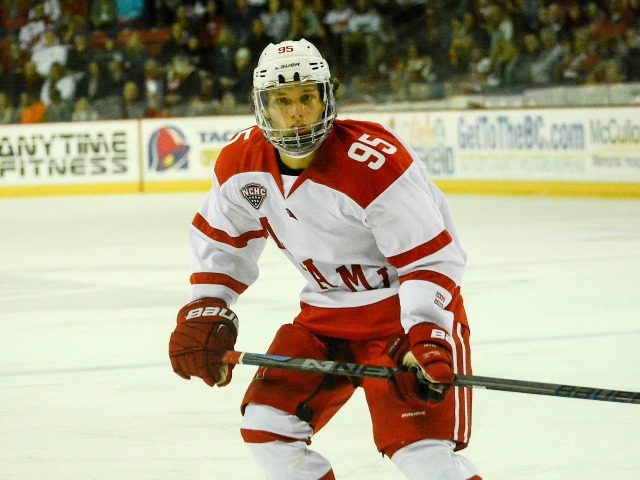 Other than Walker, two Bowling Green defensemen have been drafted – Mark Friedman, who has scored one and picked up two assists, and Adam Smith, who has dressed for five games. Special teams have been a disaster for the Falcons, who are tied for second-last in college hockey with a 66.7 penalty kill percentage and are 46th on the power play at 10.6 percent. Miami is 11th on the man advantage at 21.4 percent and tied for tops in the NCAA with a 96.7 PK percentage. 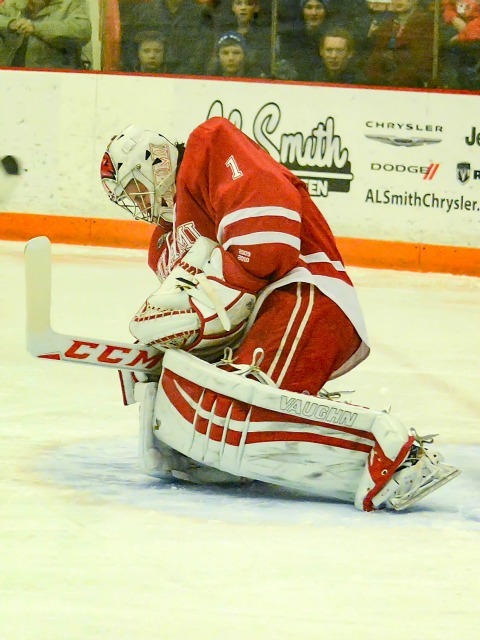 If this series comes down to goalies, the RedHawks should have a definite advantage, as freshman Ryan Larkin is 13th in the NCAA in save percentage (.931) and 11th in GAA (1.75). Miami enters play unbeaten in its last four (2-0-2) and owns a 1-0-2 home record. The RedHawks are 18-1-1 against Bowling Green in these teams’ last 20 meetings, although the Falcons still hold a 59-49-8 advantage all-time. 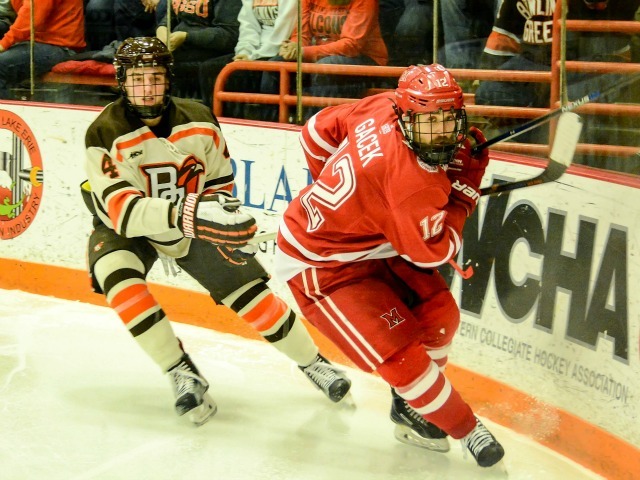 Images from the game played at BGSU Ice Arena in Bowling Green, Ohio, on Feb. 12, 2016. All photos by Cathy Lachmann. 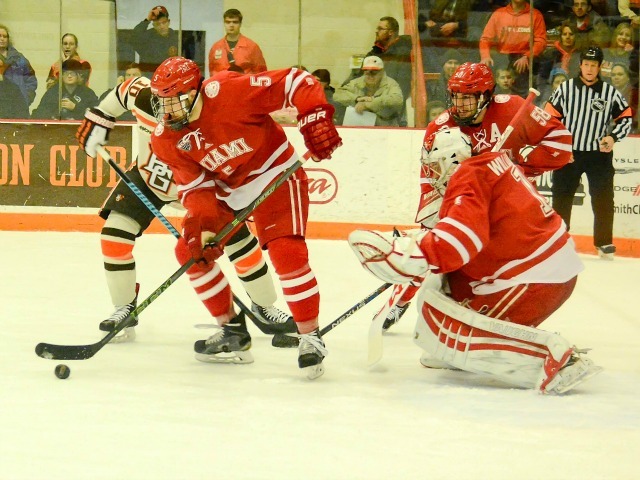 BOWLING GREEN, Ohio – Friday’s game was an interesting mix of both halves of Miami’s season: The first portion when the RedHawks couldn’t score and the most recent segment when they could. 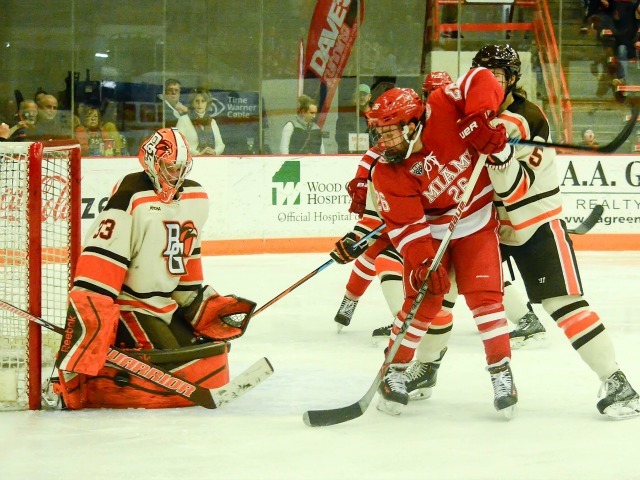 Miami scored four times in the final 28 minutes to beat Bowling Green, 4-1 at BGSU Ice Arena after failing to hit the net on 16 first-period shots and a handful more in the middle stanza before breaking through. The RedHawks scored an average of 2.07 goals in calendar year 2015 of this season and are netting 2.92 in 2016. Not coincidentally, Miami was 5-9-2 on New Year’s Day and is 7-4-1 since. And the RedHawks have found scoring from other sources than Jack Roslovic and Josh Melnick. They’ve had to, as both have two markers in their last 11 games. Sean Kuraly is back to his 19-goal form of 2014-15. Anthony Louis is doing his Anthony Louis second-half studly thing. Kiefer Sherwood was coming into his own before joining Roslovic’s top line and he’s thriving now. BoB has said since August that with its core of veteran defensemen and goalies, this team would be fine if it can score enough. Now it is. Miami has allowed five goals three times in its last 11 outings, all losses. MU is 7-0-1 when allowing three or fewer in that stretch. Friday’s crowd was a hostile one as well, and seeing the RedHawks play so well in that environment bodes well for them the next couple of weeks, as they will visit Western Michigan and Minnesota-Duluth, sandwiching a home series vs. Colorado College to wrap up the regular season. Five wins in those final six would be optimal, four would get Miami over .500 but probably not where it needs to be in PairWise. Three or fewer would be a disaster against the fourth, seventh and eighth place teams in the NCHC. 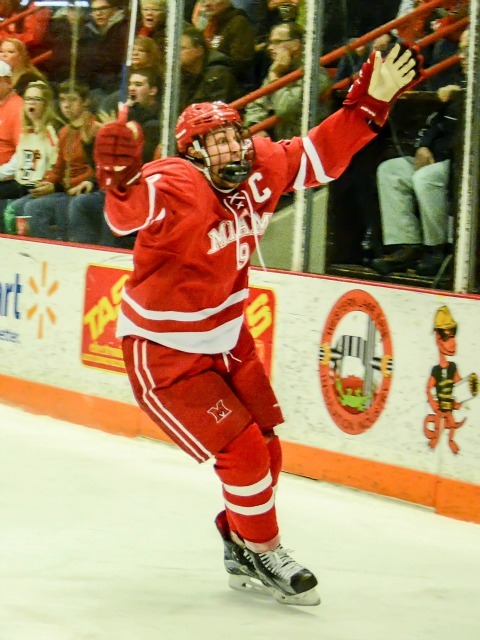 The way the RedHawks are playing right now, there’s an excellent chance they win the majority of their remaining regular season games and earn home ice for the first round of the NCHC Tournament. – This was a tough game to watch as a Miami fan, because one (OK, I) got the feeling the hot goalie – BGSU’s Nell – might steal one. He made some good saves and the RedHawks missed some great chances. The Louis goal seemed to open the floodgates, and after the Kuraly goal, MU did an outstanding job of fending off the Falcons’ ensuing surge at the end of the second period. – Speaking of Louis, I have no idea how he scored the equalizer. He had no apparent angle to shoot at and somehow was able to roof one. What a great way to make up for fanning on a high-quality opportunity earlier. – Really impressed with Kiefer Sherwood since January. Having a future NHL star in Roslovic on your line doesn’t exactly hurt, but it feels like he’s going to put up huge offensive numbers in his four years in Oxford. 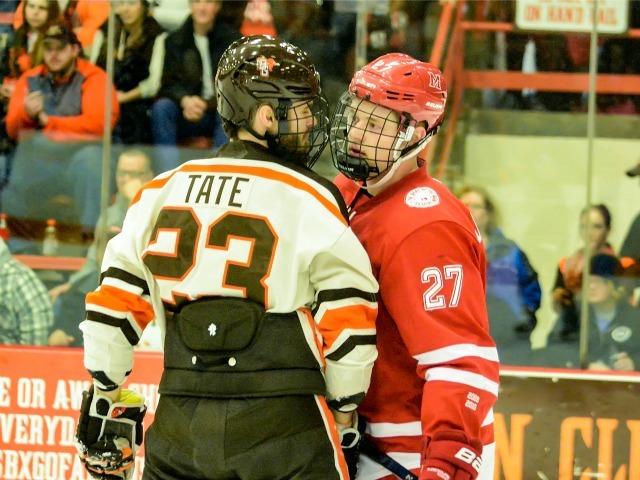 He was involved in a pushing match in the first period with a chippy BGSU team, and that seemed to elevate his game, the sign of a strong player. – These were definitely not NCHC officials. There were 11 total power plays – seven for Miami, tying a season high – including a pair of two-man advantages. Don’t have the stats for it, but I can’t remember Miami or an opponent having a 5×3 all season. It’s rare to see a team with four or more power plays in a game with NCHC referees. Definitely inconsistent. – Great BGSU crowd. The rink was sold out, and the Falcons fans were enthusiastic and into the game, which unfortunately is not always the case in Oxford. Best of luck to Bowling Green the rest of the season in its quest for the NCAAs. FORWARDS: A-. Really liked the Melnick-Gacek-Louis (AJA – Anthony, Josh, Alex) line. The Crash Cousins line was also strong, barring a bad turnover by Conor Lemirande at his defensive blue line which fortunately didn’t result in a goal. Loving that top line, of course, which accounted for two goals. If we had to nitpick, and that’s what we do, Roslovic is still too committed to carrying the puck through multiple defenders, and as a result he turned it over too often. DEFENSEMEN: A. Bowling Green was super aggressive, leading to some solid scoring chances, but this corps did a great job of shutting most down. Louie Belpedio broke up a 3-on-1, and Chris Joyaux and Grant Hutton shut down quality opportunities as well. Taylor Richart did his unsexy shut-down thing as well, as did Matthew Caito, who pumped in the clinching empty netter. GOALTENDING: A. Jay Williams had to deny a clean breakaway 52 seconds into the game, and he shagged it cleanly to set the pace for the rest of the game. He had to make his best stops in the first period, and Bowling Green scored on a point-blank tip that he had little chance on. Williams has appeared in 11 straight games with no end in sight, and hopefully he won’t tire down the stretch run, as it appears he is this team’s only option for the immediate future. LINEUP CHANGES: Joyaux was back in the lineup, replacing Colin Sullivan on the blue line, and Andrew Schmit was back on the fourth line, replacing Ryan Siroky, who sat for just the second time in 2015-16. Devin Loe centered the Crash Cousins’ line, which played well with the exception of the aforementioned Lemirande turnover. Still no word on goalie Ryan McKay, who is suspended indefinitely. Evan McCarthy remains Miami’s backup in net.